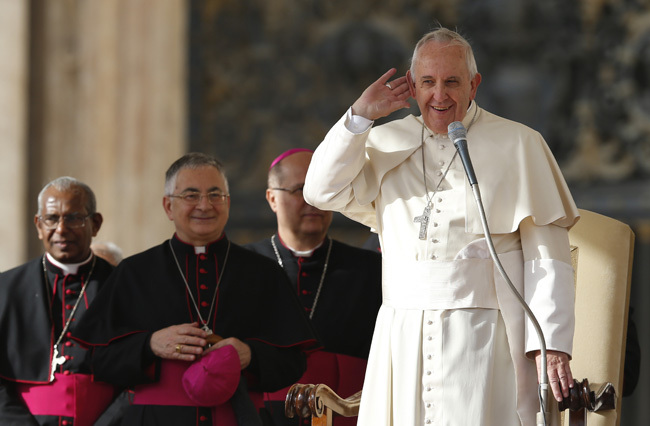 VATICAN CITY (CNS) — Pope Francis said the church’s marriage annulment process should be more efficient and perhaps even free of charge, and he decried any attempts to exploit it for profit. The pope made his remarks Nov. 5, in a meeting with diocesan officials and canon lawyers enrolled in a course offered by the Roman Rota, the Vatican tribunal primarily responsible for hearing requests for marriage annulments. Pope Francis said participants at the Oct. 5-19 Synod of Bishops on the family had expressed a desire to “streamline the process” of judging requests for annulments, and he noted that he had recently established a special commission to do so. As an example of the burdens faced by those seeking annulments, the pope recalled that a tribunal he oversaw as archbishop of Buenos Aires exercised jurisdiction over dioceses as far as 150 miles away. Pope Francis warned that annulment cases must not fall within the “framework of business,” which he described as an all-too-frequent occurrence. “I am not talking about anything unusual. There have been public scandals,” he said. Pope Francis has related difficulties with the annulment process to the situation of divorced and civilly remarried Catholics whose predicament he has said exemplifies a general need for mercy in the church today. A proposal by German Cardinal Walter Kasper to allow some divorced and civilly remarried Catholics to receive Communion without meeting either of those conditions was one of the most controversial topics at October’s synod and is likely to come up again at the world synod on the family in October 2015.